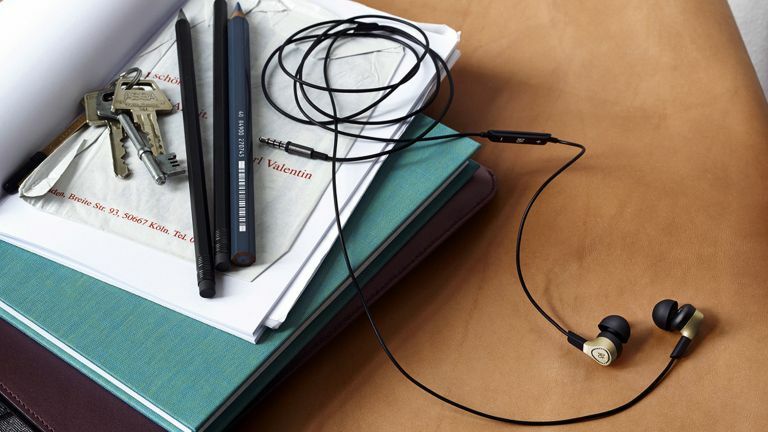 The best wired, in-ear headphones – and there are many excellent examples – offer a great listening experience by blocking out the outside world and channelling sweet sounds into your ears. This type of in-ear bud might no longer be at the cutting-edge of style or tech but they still offer tremendous performance and (sometimes) value. Wired buds almost invariably offer a more natural sound and higher fidelity than comparably priced Bluetooth headphones. While, yes, the wire can snag and will eventually wear out, at least they can't be disconnected by radio failures, or the batteries running out. I mainly test more 'modern' buds but every time I go back to in-ear headphones that are wired I usually find myself thinking, "Hmm, these still sound way better than Bluetooth". With Black Friday deals approaching, this is still a great time to buy wired buds and in-ear monitors, if the best audio quality is what you desire. What is the best wired, in-ear headphone? T3's 'best bud' is the KEF M100. I've been using this classic for three years now, have taken zero care of them, and they're still going strong. The sound is just incredibly easy to get on with – not artificially bassy or loud, but with plenty of presence; very musical, in short. And when you require them to rock, they can. Along similar lines but with a more upfront sound, is the Klipsch R6i II. This has an even more comfortable fit and a bit more bass. I'm not sure it'll stand up to the abuse the M100 has, though. If you have money to burn, you can move up from mere buds to an in-ear monitor. This basically means, "a more expensive in-ear headphone, for more serious people." On this front, it's very hard to argue with the Flares Audio Flares Pro Earphones. That's because not only do they sound fantastic, they also come with the ability to go wireless, thanks to a plug-in Bluetooth DAC. Yes, that is a weird concept, but the aural results are blissful. Flares's Jet 3 are also excellent, and comfortably under £100. If you want a really cheap pair of superb-sounding in-ear buds, the SoundMagic E11 range just cannot be beat – there's a choice of 3.5mm, 3.5mm with control and mic and a Lightning connector option, from just £39.99. Buying in-ears is not as easy as over-ears because you often can't try before you buy in shops. You know, people get a bit funny about you shoving their stock into your ears. However, thanks to the magic of distance selling, you CAN send in-ears back to online retailers (within 2 weeks) if they turn out to sound bad, or not fit in your ear holes or even if you just decide you don't like them. Wired, in-ear headphones tend to have the least longevity of any headphones: they're tiny, mainly used outdoors, and have a wire to snag. So we suggest you either don't go too expensive when purchasing, or treat them with care. In-ear headphones can also be more difficult to get great sound out of than on-ear and over-ear headphones, so unfortunately we'd also recommend you don't go too cheap. The sweet spot for me is in the £50 to £150 bracket. More expensive in-ear headphones (often referred to as In Ear Monitors or IEM, to distinguish from mere ear buds) move in a much more audiophile direction and are used for serious home and away listening sessions, or pretending you are Bono playing Wembley Stadium (or maybe Wembley Arena, these days). Most in-ears come with a plethora of different sized and shaped ear tips, to suit lugholes of all sizes and type. For excellent noise isolation and improved audio, without sacrificing comfort, I strongly recommend the earplug-like Comply eartips, which can be bought separately, if your earphones of choice don't come with them. Comply tips are a little like ear plugs – you squash them down to fit in your ear, then they gently return to their original form. Available in a variety of sizes, from £15-£20 Complys aren't cheap, but they're worth the money especially for those of us with oddly-shaped aural apertures. The KEF M100 in-ears have been around a few years, and have gradually ascended to number one on this list as I've come to appreciate their charms more and more, over time. They've got an unfashionably open and accurate sound, rather than the overtly bassy sound that many buds push. They don't lack bass, they just don't provide an excess of it. As such they're reliably excellent with all forms of music, although you do need to turn the volume up higher than with some in-ears, presumably due to higher impedance. Another thing that's really grown on me is the very simple yet comfortable and reliable fit. There's no need to wrap them around your ears, 'screw' them into your earholes, or get out the Comply tips with these ones; I've used the default tips on everything from flights to gym-trips and they always stay in place, providing decent but not claustrophobic noise isolation. With a high-performance 10mm driver and precision-cut aluminium casing in a choice of colours, they also look highly classy, and I can vouch for their longevity, having had them for three years, in which time I have taken no care of them whatsoever. In short, this blend of KEF's traditional audiophile instincts with contemporary styling is a fantastic product, great value, and the best in-ear headphone, pound for pound, that you can get. Klipsch used to be quite a big deal in UK headphones, then vanished entirely. But now they are back, back back, and picking up where they left off with a new version of their very popular R6i in-ears. Given more time, I could see these replacing the KEFs as my favourite. Everyone is different of course, but for me the unusual fit of the R6i immediately felt comfortable, secure, and provided optimal sonic results from these sub-£100 beauties. The fit I would describe as being similar to an in-ear monitor, but without the uncomfortable pushing and screwing in. It's like a proper in-ear fit, but with more of a 'bud' type feel. It's very good, anyway. The audio is considerably more boosted, primped and mucked about with than on the KEFs, with plenty of bass and a very lively and engaging sound that is easily the right side of being artificial or, as I like to put it, "Beats-by-Dre-esque". I do accept that for this reason, some purists will prefer the KEF or Sennheiser headphones, but hyping the sound and pushing the bass doesn't bother me, when it's done right. The only issue with this approach tends to be with older tracks – something like The Who's A Quick One (While He's Away) does end up sounding a bit too bottom-heavy, but records made after about 1967 sound super-fab. Only time will tell if these prove to be as indestructible as the KEF M100 but Klipsch is bullish about the longevity, offering as it does a 2-year warranty. Flares have been around for a fairly short while and initially carved a niche by making very audiophile, but affordable, in-ear headphones. These would tend to come with endorsements from people such as the bloke who produced ELO's third album, or whatever. They were alright, especially if you like classical music and classic rock. However, in recent years, Flare has started making earphones where the emphasis is as much on excitement as it is on fidelity and suddenly their appeal is a lot broader. These are just fantastic with everything from choral music to electronic pop to Black Sabbath to dub reggae, and while I wouldn't call them 'audiophile' in the sense of being purely faithful to the source material, the way they subtly colour the sound – without turning it into a synthetic soup – makes them truly exciting. Heard through a good DAC – I really rate IFI's xDSD at the moment, for convenience and quality – the Jet 3 can sound absolutely glorious, especially considering they only cost 90 quid. However the really good news is that they sound splendid just when plugged straight into my trusty old iPhone 6S, from back in the old days, when iPhones had headphone sockets. They're not dependent on the source being a 90000-bit, 5 bazillion megahertz file, either. Spotify sounds great, Tidal Hi-Fi can sound quite epic. Flares buds always seem to be rather eccentrically designed, and the long stems that go into your ears on the Jet 3 mean you have to very carefully choose your eartips. I didn't find any of the selection provided anchored them completely properly – the problem is that the stems act as a lever and start trying to pull the buds down and out of your ears when you are walking. However, not for the first time, a pair of Comply tips came to the rescue, resolving issues I'd been having with the audio and the fit. Hoorah for Comply! My colleague Chris Haslam was very effusive about the old SoundMagic E10C but I did always wonder how good a pair of buds costing under £50 could be. Shows what I know, because it turns out the answer is 'very good indeed'. This follow-up, logically called E11C sounds easily as good as certain in-ear buds costing twice as much or more. Even more impressive, the build quality seems very sound as well, with metal buds and a reinforced cable. The metal construction doesn't reduce comfort, and the size, shape and weighting of these make them easy to just plonk in your ears (well, in my ears at any rate) and forget. There's no need to 'screw' them in, or wrap them over your ears, or any of that fol-de-rol. Used either through a DAC or straight from a compatible phone's headphone socket the E11C punches way above its weight. The sound is really engaging, and while there's plenty of bass, SoundMagic hasn't just whacked the bottom end up to disguise deficiencies elsewhere. I think of £49.99 as cheap for a pair of buds, but if that's still a little high for you, you could consider the E11 (39.99), which is the same thing but with the mic and remote removed. Owners of Android phones and laptops including recent MacBooks might want to try the E11D, which has a USB-C connector. That's £59.99 though – comparatively spendy. It may look more like some sort of kit for would-be electricians, but the Flares Pro is one of the best pairs of in-ear headphones I've ever heard, for the money. They come in a fantastically designed box made of a material reminiscent of acoustic wall tiles, accompanied by a veritable plethora of tips, suitable for just about every type of ear and way of listening. That is just as well, as the Flares Pro is fairly unforgiving of being poor fitted. In fact to be blunt, with the wrong tips, it sounds crap. Experiment till you find the right pair, and the magic will happen. As usual, I favoured a medium sized squashy, Comply-style one. As with a lot of higher-end IEMs, the Pro does benefit from being used with a high quality source or a decent headphone DAC, but even from my old iPhone 6S, once you push the volume up, the Flares Pro offers up exceptional clarity across the whole spectrum, with enough bass to really kick the music along. Even at their slightly testing price, the Flares Pro would be a decent deal just as a pair of wired in-ears. The really extraordinary thing about them is they also come with a Bluetooth DAC. Yes, the 3.5mm cable can be screwed off, and a very high quality, wireless receiver added instead. There is a bit of an issue with this, as what's left of the cabling is way too short, meaning you're forced to clip the DAC either to the back of your collar, or to your lapel, rather than being able to put it in a jacket pocket. You can read more about the Flares Pro in Bluetooth mode over at T3's list of the best wireless headphones. Even so, given that you're getting one of the best wired headphones in its price bracket and probably the best Bluetooth in-ear headphones, sound-wise, you may decide you can live with the Flares Pro's design foibles. Our first thought on opening the box on the unpromisingly-named Brainwavz B200 balanced armature headphones was, "Wow, that looks plasticky and crap". Just goes to show how wrong first impressions can be. Once fitted with the supplied Comply tips (a range of silicone ones are also included, but gave a much less pleasing fit, for us), these sound really stellar. Admittedly, if you like your bass "pumpin'" you might find the more nuanced low-end performance of the B200 a bit light but we found them fine with everything but the most thunderous, dub-inflected sounds. The sound bristles with life and clarity and they're just very, very easy to listen to overall. The plastickiness also works in the B200's favour in terms of being very lightweight and comfortable to wear – just loop the cables over your ears, then insert firmly. With the Comply tips adding excellent noise isolation, these are highly addictive headphones. If you're after a reliably good pair of headphones, Sennheiser is as good a starting point as any. Its first earphones from the Momentum line are a good few years old now, but earphones just don't date like most tech products do. The M2IE boasts fantastically detailed sound, plenty of bass and dedicated versions for both iOS and Android. There are plenty of other strong in-ear options from Sennheiser, notably the IE range, but the Momentum M2IE pulls off the killer combo of strong audio, reasonable pricing and smart looks. They also fit comfortably in the ear – not as deeply as some, but then many people don't like those kinds of full-bore ear stuffers. If there's one area that the M2IE shows it's age, it's in the fact that the ear-tips are the old-fashioned, domed type, rather than more modernist favourites such as shaped silicone, Comply, or hooked. You can always buy those separately, though. Taking the punchy, signature Klipsch sound up a notch, these are somewhat pricier than the R6i II, which is justified by improved audio without sacrificing any comfort. They are incredibly light, and once you find the right ear-tip for you – this is more involved than with the R6i but hardly a labour of Hercules – the sound is great. The performance is even more refined than the R6i but still capable of going big and loud when required. One thing I am not sure about is their longevity, as they look and feel a bit flimsy – that's hard to avoid when you make headphones this light. That's not to say they will crumble and break, just that they don't massively inspire confidence on that front. Time will tell. Anyway, if you're spending £200+ on in-ear buds, you are under a bit of an obligation to look after them. A step up the price trail towards the summit of Mount Expensiveness, the RHA T20i is nonetheless still hugely desirable. Sound is superb across the board, here, but if you for some reason don't find it quite right, there are actually three clever, interchangeable filters included, which customise the audio profile to suit your taste. The options, as you'd imagine, are 'regular', treble-boost for opera lovers, and bass-boost for all dubstep mans dem. Made of steel, they're among the more solid in-ear 'phones we've tried, but although they could easily verge on heavy and uncomfortable, they're actually pretty comfortable, thanks to the mouldable around-ear wires. With a large array of tips in the box you're bound to find one that fits, and noise isolation is also impressive. T3 liked the original SoundTrue range for its solid build quality, sport-inspired eartips and consistent sound quality. Subsequently upgraded and all the better for it, the newest version of the SoundTrue buds boast a super soft and seriously secure fit, as used in the best running headphones. While not the sexiest thing we’ve ever put in our ears, they’re ideal for long listening sessions, with a pleasingly rich sound across a wide frequency range. Really expensive in-ear monitors (IEM) are a growing market segment, which is a little surprising given that they should be intrinsically less comfortable and less impressive sonically than similarly high-priced over-ear headphones. However, if that's the market you're buying into, Grado are your boys. The GR10 don't sit in the ear as firmly as some, and you can forget about the bass-forward, rockin' sound generally associated with in-ear headphones. These have a far more audiophile-friendly, clean sound, suitable for long-term listening in discerning ears. Targeted firmly at audiophiles, these are that rarity in the UK market: in-ear headphones designed for the home, not the morning commute.